I’m sure none of us would disagree that spending time alone with ourselves is beneficial, although many might argue that they can’t find the time or that they manage fine without it. I think neither are true; we can find the time and we need to find the time, because like a car that has begun to swerve out of control while speeding down the road, we too will eventually crash when we’ve ignored our inner selves for too long. 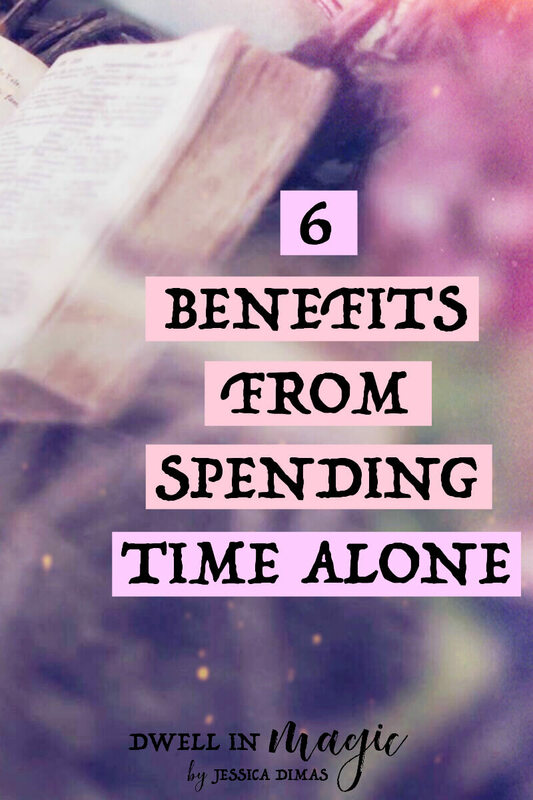 Here are 6 benefits for spending time alone regularly and also some tips for how to make the most of your time. Our world is so fast-paced and everyone is constantly doing something, that we forget how truly necessary it is to just relax. Your body needs it and your soul really needs it! When we relax by ourselves in a quiet place, it allows our body and mind to unwind, which is exactly what we need in order to let go of conscious as well as subconscious stress we accumulate throughout the day. You know how so many people will turn their radios off in the car when they’re trying to follow driving directions and it seems to not make any sense because sound shouldn’t affect your ability to think? Well it does. Noise and the hustle and bustle of every day life makes it hard to just think. And thinking clearly without any distractions is something we need to be able to do every day in order to remain healthy, happy and to address feelings that have been coming up for us. We are always in a constant state of becoming; always working to better some aspect of our lives. When we ignore the way we’re really feeling on the inside about stressful situations, conversations we’ve had or plans and goals we’ve made, we lose touch with the one aspect of our ourselves that has the ability to soothe and reassure us. When we’re alone with ourselves, we finally get the chance to think about how we’re really feeling about things going on around us. We can be honest with ourselves and face our biggest insecurities, and once we do that, there’s nothing left to be afraid of. We work things up in our head all day long, so we need time at the end of the day (or the beginning) to release these worries or stressful feelings and remember that everything is going to be okay. One of my favorite books to read during my self-care time is You Can Heal Your Life by Louise Hay, and the accompanying workbook that comes with it. Those two books have done more healing for me than any therapist’s session ever did. Being able to think clearly as well as getting in touch with our true feelings helps us to find solutions more easily because we know exactly what we need and want to do to solve something we’re facing. Goals or intentions can change by the week, and sometimes by the day. We’re always evolving and refining ourselves, and that means our goals too. You might state a certain goal one month, and then view it differently the next month; it may need revising or clarification. Without doing this, it’s very easy to lose sight of your goal completely. Being alone with yourself gives you the opportunity to check in and discover any true inner desires you have surrounding your goals. If you’ve been stressed, upset, depressed, worried, or just in a negative funk that you can’t seem to shake off, alone time gives you the chance to take some deep breaths and turn yourself around. Having alone time, depending on when you have it, can alter the day ahead of you if you spend time with yourself in the morning or the following day if you spend your alone time at night. It can make literally all the difference in the world. I am so passionate about this I created a guide & worksheet bundle that helps me reboot my mindset and get me back on track with a consistent self-care routine. + Schedule it. All you need is around 10 minutes a day (more is better but magic can still be found with only 10 minutes of alone time). Anyone can come up with 10 minutes a day. Are you a morning person or a night owl? Are you most overwhelmed in the mornings or after a long day? These questions can help you decide when it’s the most beneficial time for you personally to schedule alone time. This is how I’m scheduling my self-care routine this year. + Turn off distractions. Put your phone on silent, turn off the TV, make sure your kids are occupied or sleeping…just try to set it up to where nothing and no one is going to interrupt you for at least 10 minutes. + Journal. You don’t have to be a writer in order to journal. And you don’t have to make some formal journal entry or write every day. It does help every so often to write down how you’re feeling, especially if you’re stressed or confused about something. It’s amazing the things you’ll find out about yourself when you let yourself write freely. There’s a true inner you that knows exactly what you want and what you need, and that inner you will come out during journaling! Make a writing prompt at the top of the page such as “How am I feeling right now” to get yourself started. + Write down your goals/intentions. I cannot stress enough how important it is to write down your goals! There is magic in writing down things you want to manifest. Not only do they give you a sense of direction and purpose, but they make life more exciting! Like I already mentioned, your intentions can also change frequently because you are constantly evolving, so you may find that you need to revise them every so often so that they still excite you. And if they don’t, then you know to toss them and write some new ones. One of my favorite planners is The InnerGuide because it helps me remember to check in and evaluate how I’m feeling and excited for the intentions I want to manifest. + Deep breaths, aromatherapy, + a guided meditation is like a mental spa retreat. Sometimes all I do is sit on the edge of my bed, take deep breaths, and spritz my favorite grounding spray all around me and I feel calmed. I also have a saved list of guided meditations that are all 20 minutes or less and they help me so much to re-set my mind and lift my vibration. I hope you found some of these tips useful! Do you take time for yourself on a daily basis? If you’d like free self-care resources, sign up for the Dwell in Magic weekly newsletter. 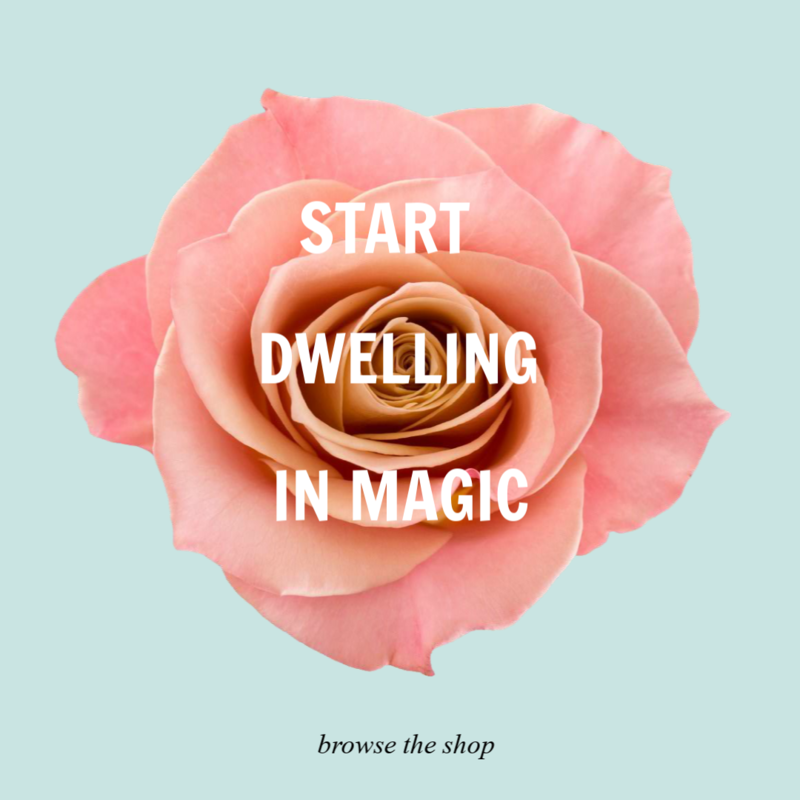 You can find me over on Instagram sharing bits of my self-care routine and rituals on Insta stories, and I also invite you to join the Dwell in Magic Facebook group if you’d like more self-care support. 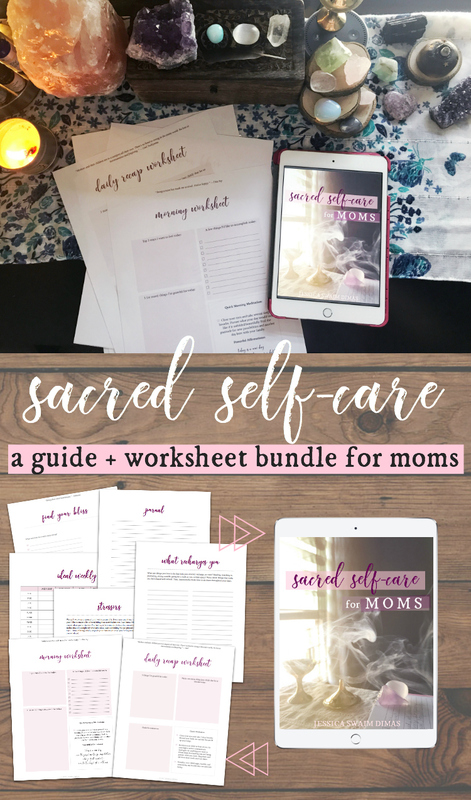 Jessica Dimas is the author of Sacred Self-Care for Moms Guide + Worksheet Bundle. Connect with her on Facebook and Instagram for more inspiration and updates. I used to hate being alone but I’ve actually learned to love it, and there’s so much you can do when you’re alone! Plus you get to worry about your needs! <3 I love taking naps when I'm alone and it helps me get so much work done and brainstorm for the future. Great post!